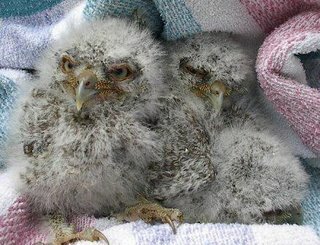 HAWK Center is: Helping Arkansas Wild "Kritters": Owlets! We received a page to our hotline pager around noon today from a gentleman in Hot Springs Village. The circumstance was that the caller was a contract excavator and his team had accidentally taken down a snag inside which a screech owl had nested. Down came the dead tree and with it, three teeny and fuzzy screech owls. Their primaries starting to show, the caller was very concerned for their well being. Unable to place them back in the nest since it had been destroyed, I advised for an artificial nest to be made. Time was of the essence - not so urgently for the owls, but for the busy contractor. He was on a very tight schedule and couldn't take the time to figure out a contraption that would resemble a screech owl nest. Due to the panic in his voice, I decided to make the ninety minute drive down there to check it out. Now, I've never been to Hot Springs Village and had no idea it was a gated community AND they had TWELVE golf courses. My directions said the site was near the golf course! After stopping at the security gate and obtaining a permit to pass and mapping directions to the site, I made my way to the scene of destruction. When I pulled up, the workers immediately ceased activity and focused all attention on our task to get these babies back to their mama. I just happened to have an old formula bucket in the back of my car, with which we crafted a new nest for the babies. Several holes in the bottom for drainage and a hole on the side for mom to come and go, then the nest was ready. 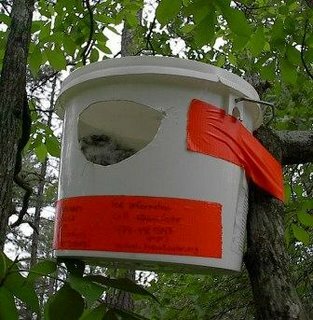 We labeled it as a temporary nest with contact information in case anyone had questions about it. Then, the manufactured nest was hung in and duct taped to a tree near where the original nest had been downed. We placed the three little babies inside and they immediately settled down as if it was just like their old home. Now, the job is back in the parents talons and we wish them the best. I'm sure these thoughtful and generous contractors will be keeping a watchful eye on their babies as well.